SCHOOL MUSICAL OLIVER ! IS ON FROM TUESDAY 12TH – FRIDAY 15TH FEBRUARY IN THE SCHOOL. TICKETS ARE AVAILABLE FROM THE SECRETARY’S OFFICE OR BY PHONING 090 6453600 TO RESERVE TICKETS. Gallen CS Ferbane third year students Moya Ibbotson, Mollie Flynn, Ava Grace Egan and Eoin Sheridan who took part in the Irish Applied Maths Teachers’ Association Junior Problem Solving competition in Moate Community College last Thursday January 24. Gallen CS 6-10 Clonaslee VS 3-3. Gallen CS qualified for the North Leinster final by virtue of this excellent win against a tough Clonaslee VS side in their semi final match played in Ferbane on Friday February 1st.Gallen after a tough contest with Kilcormac VS in the quarter finals, were ready for this semi final tussle.A good start is always half the battle and Gallen helped by 1-2 from Luke Coleman in the first five minutes got that start. Clonaslee did hit back with a goal but Gallen midfield began to get on top and a ready supply of ball into their forward line saw them hit three more goals in the first half to lead by 4-7 to 3-1. In the second half Gallen added two more goals to close out the game with Ciaran Lally and Eoin Tighe making contributions. The tight Gallen defence limited Clonaslee to 0-2 in the second half.Well done to all the team and their mentors Mr .Garry and Georgie Phibbs. 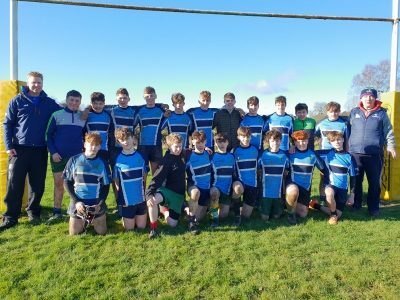 Gallen will now contest the North Leinster juvenile final against Pipers Hill College Naas ( who beat Bush PP from Louth in the other semi) . 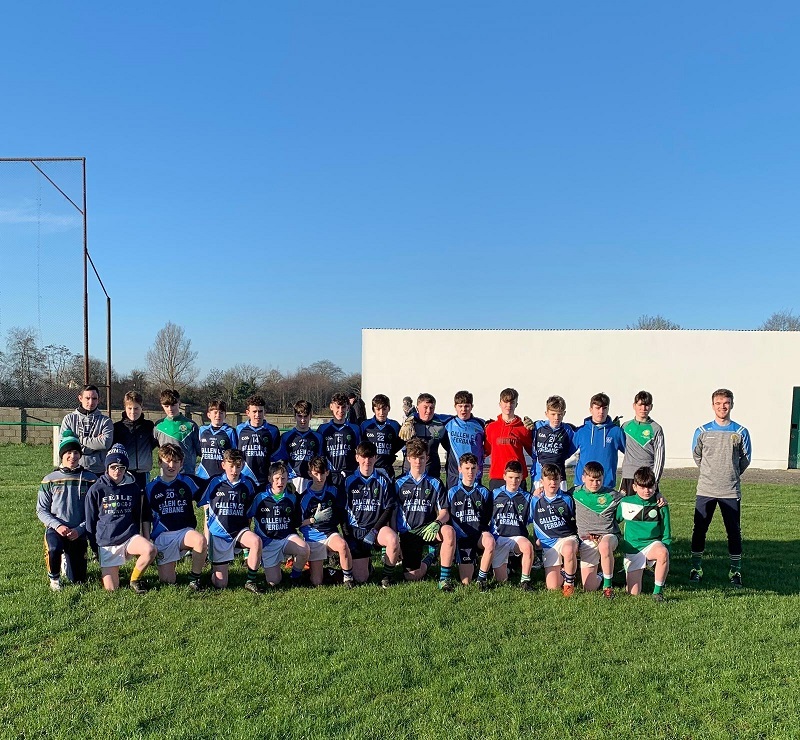 This will be Gallen’s first appearance in a North Leinster juvenile final as a combined entity having won the 2000 North Leinster and Leinster titles as St. Saran’s Ferbane. 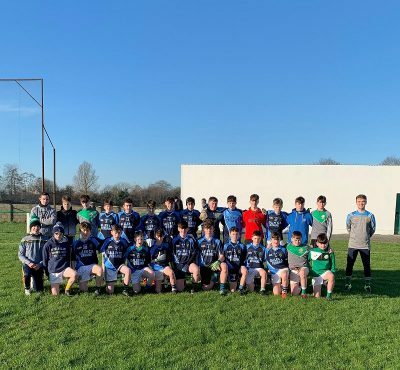 The team was – Oisin Carroll,Donal Flynn,Michael Spillane,Saran Flynn ,Mark Wren ,Patrick Taaffe,Ruairi o Neill,Conor Beirne ,James Buckley, Matthew Darcy , Luke Coleman, Conor Grennan, Brian Carroll,Ronan Flynn and Luke Kelly. The Gallen CS Se Girls Rugby team pictured, created a bit of sporting history by being the first girls team to represent our school in Rugby. 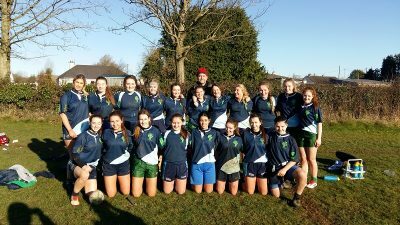 Despite losing to Ardscoil Mhuire Ballinasloe, the girls gave a good account of themselves and will benefit from the experience. The girls have further games against The Convent Roscommon, Sacred Heart Westport and Athlone CC.The girls first learnt their rugby at West Offaly Lions where they won a Leinster Title. Thanks to Mr . Deery for coaching the team. 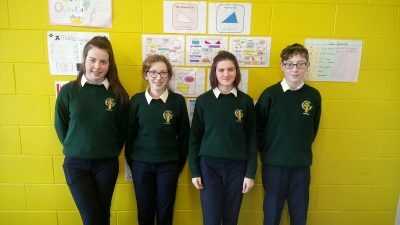 The panel was , Rosanna Egan , Zoe Tighe , Katie Newman , Jenny Darcy , Chloe Daly , Sophie Loonam , Abaigeal Connon , Jane Egan , Siobhan mc Kenna , Shauna mc Govern , Therese Lyons , Ella Hogan , Emma Bracken , Chiara Rotelli , Kira Hackett , Niamh Byrne , Rachel Bracken , Aoibhe Kelly , Aimee Kelly and Megan Murray. Congratulations to Zoe Tighe , Aoibhe Kelly and Siobhan mc Kenna who have been selected for Leinster u 18’s. CS rugby team helped by 5 tries defeated Headford in the Connacht Junior Cup. Panel- Seamus Daly,John Dunican,David Dunican,Cian Boylan,Fergal Bracken,Shane Berry,Oisin Carroll,Patrick Taaffe,Nick Cusack,Cormac Mc Kenna, Matthew Darcy,Conor Poland Murphy, Luke Balsiger,Ciaran Lally,Glen Fletcher,James Buckley,Adam Greene,Levi Ward,Nathan mc Intyre and Dillon Kavanagh. They play St Endas Galway next. Thanks to Mr .Mc Grath and Charlie Couper for their work with the team.